Panelists and participants at the event. Picture by I.L.M. Rizan, Addalaichenai Central Corr. Housing, Construction and Cultural Affairs Minister Sajith Premadasa has planned to construct 300 houses under the model village project for homeless families in the Addalaichenai DS division on the request of Parliamentarian A.L.M. Nazeer. A special meeting was held in this regard at the Addalaichenai Divisional Secretariat auditorium, recently. Addalaichenai Divisional Secretary J. Liyakkath Ali presided. Parliamentarian A.L.M. Nazeer spoke at the meeting. Ampara District National Housing Development Authority Manager S. Kalansooriya, land officers, Grama Niladharis, economic development officers and Samurdhi development officers participated in this meeting. Parliamentarian A.L.M. 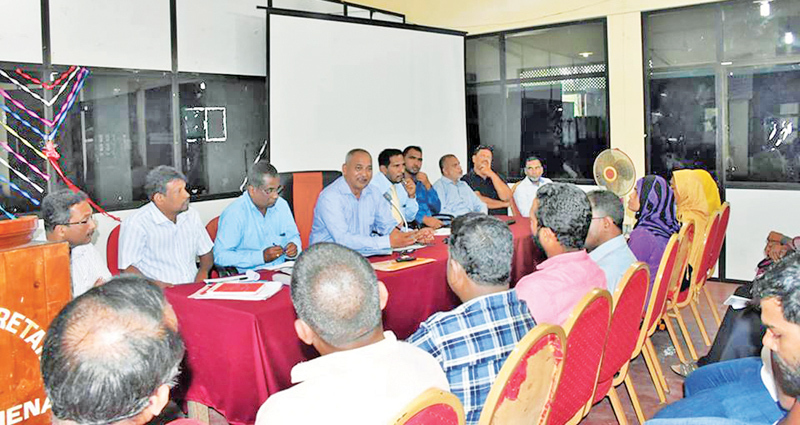 Nazeer said the government has set aside a large sum of money for rural housing development during the past four years. He said the government has plans to construct 20,000 Uda Gammana by 2025. Under this project, 300 houses are expected to be constructed for underprivileged people in Addalaichenai, Oluvil, Palamunai, Ashraff Nagar, and Sambu Nagar in the Addalaichenai Divisonal Secretariat Division.